And more concretely FMNH PR 2081, also known as "Sue". Edited: pictured updated after more recent and rigorous studies and skeletal drawings. Before you ask, yes, it is mildly inspired by Saurian's Tyrannosaurus. The feet are oversized here. It's a good thing that you reduced the leg length, but you did it without reducing the size of the feet, which is incorrect. You can check that the size of the feet are smaller in this version: img13.deviantart.net/92b4/i/20… than in this version: 1.bp.blogspot.com/-9EXibr4W1Ig… and in your version. Nice update overall, reducing the leg length and making the neck and the tail at the beginning thicker are the most important and best updates, but why did you make the front of the skull rounder? You can see here that it is squarer than that: 3.bp.blogspot.com/-PgIFCmrN1CY… I would also ask Scott Hartman about the small horns above the eyes, and why did you make the skin smoother? shouldn't the teeth be showing? The current consensus is that all dinosaurs had lips covering their teeth to protect the enamel from drying out, except maybe water dweling dinosaurs like spinosaurids whose teeth would have been wet most of the time. Oh, it's getting a huge update soon, not only regarding the legs but also textures, mass and feather distribution based on the most up to date science. I think it would need an update based on the 2013 skeletal of Scott Hartman. The neck is noticeably too thin. The neck should be very thick a muscular to hoist is very robust, compacted skull. The tarsal should also be more muscular. Finally, the base of its tail should be thicker. Other than the flaws, it is pretty nice. The skull shape seems a bit off (a bit triangle shaped), but still a good work. Maybe the bulgy pouch gives that impression but the skull is traced directly over Scott Hartman's reconstruction of Sue, so I doubt it. The back of the skull looks like doesn't reach the end of the lower jaw behind the eye like eg. Giganotosaurus, but if I'm not wrong, the back of Sue's skull behind the eye is reach the end of the lower jaw. It does reach the end of the jaw, you must be confused because of the feathers covering the postorbital region and hiding the jawline and earholes. There is this tendency people have on many concepts that something has to be either/or when it comes to certain features (possibly because its just so much simpler to think that way). 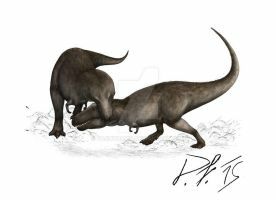 Its like the whole predator vs scavenger argument for the T.Rex, its most likely it was a combination of both (even changing at different times of the year or in different life stages) like most modern carnivores, and yet people try and lump the creature into one side of one argument mostly by just shouting loudly. My personal thoughts regarding feathered Tyrannosaurs is that infants/juveniles were fully feathered and the coverage reduced steadily as their size increased (assuming they were mostly for insulation). It is also possible that feathers were more for display in adulthood, if they had a breeding season then they could have grown a display coat of feathers then shed them when they no longer needed them. (Deer effectively grow the equivalent of two whole limbs in antlers every year, so a new feather coat is easy by comparison). It equally likely that one species/genus evolved one strategy and others "feathered" in different ways for different reasons. Until we find more evidence (which is never certain) all we can do is speculate, but hopefully with some wider ideas than the simple either/or arguments that prevailed in the past. Cool! It still has the potential to scare! Finally! Someone who reconstructed their feather-scale mix with the feathers slowly progressing into the scales and no "sharp boundaries." Beautiful work!!!!!!! Woah! thanks for letting me now. BTW, didn't mention it; this is for Tyrannosaurus what this ([link]) is for Allosaurus. One of my favourite reconstructions of the animal, if not the best I've seen. That´s a big compliment. Thanks man. This is the most accurate tyrannosaurus picture i have ever seen! From my understanding, the idea that large theropods did not develop feathers, at least at maturity was because they didnt need the insulation. The larger animals get, the better they are regulating body temperature. All of the largest land animals today have very little fur if at all. The discovery of the yutyrannus is very exciting, but i wouldnt be so gung ho about jumping on the feathery theropod train. I could see a rex easily sporting sort of bristly feathers here and there perhaps like an elephant with its hair. We certainly do live in an exciting time for dinosaurs, though for the time being, i still like my rexes big and scaley. Tyrannosaurs had a much larger surface area than any mammal. This, combined with the absent of brown fat, would have required feathers. Erior already pointed it out, but yes, mammalian fur is not a very good analogy. Feathers are not a "burden" in large animals since they provide insulation, help to keep the cold, display rituals and you can´t overheat with them (birds only suffer overheating under really extreme conditions). What we should ask to ourselves is: why would T.Rex NOT have feathers ? This is late but THANK YOU. Not enough people bring up the point that feathers aren't just for keeping warm, but also for cooling down. Giraffes are hairy, and are the same weight as a black rhino. "Pachyderms" are built like bricks, and make bad models when compared to dinosaurs. The extinct Sivatherium was white rhino sized and more compact than a giraffe, and it is never reconstructed as naked. Giant ground slots were elephant sized and lived in tropical areas, yet they are reconstructed with LONG hair (Xenarthans, however, have lower metabolic rates than other mammals. But, dinosaurs seem to have had also less wasteful metabolisms than mammals, and thus less heat generation). Tyrannosaurus, meanwhile, had a range that ventured into Alaska. So bad logic. 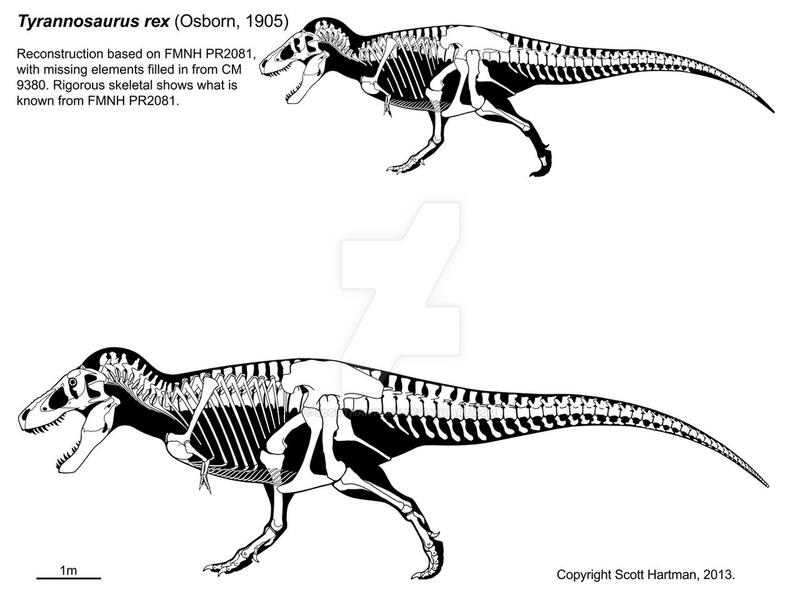 Plus, seeing its ancestors were feathered in their backs, Tyrannosaurus, if featherless there, would have naked skin. I know. It's going to be a little hard. How long untill someone will draw some of them with cockatoo crests? Not too long, I hope! But seriously, that would be going too far. The kind of feathers tyrannosauroids had were very primitive and hair-like, different to those of flying birds. like the fuzz hatchlings have? Yeah, or the kind of feathers a cassowary has [link] but nothing more structurally complex than that. Seems like "modern" feathers with barbules evolved only within maniraptorans and more specifically avimerigians, the most birdlike dinosaurs like Velociraptor and birds themselves. link dosen't work. is there one of those microscope photos of their feathers? No, it was a cassowary. Nevermind. It came out very nicely! El plumaje ha quedado muy bien, muy interesante además el razonamiento sobre el largo del plumaje, definitivamente así queda más natural. Mi única duda son los brazos, tal vez sea por la cobertura plumosa, pero me parece que deberían ser más gruesos, no? Puede que tambien sea por el shading en la parte anterior del brazo que lo hace parecer más delgado, aparte de las plumas que no son tan largas como parecen. No te falta razón, creo que voy a intentar corregir eso, y luego lo actualizaré.